A new campaign called ‘Building Tomorrow’, has been launched by Volvo Construction Equipment (Volvo CE), to promote how the company is driving a more sustainable future. Running now and throughout 2017, the campaign is supported by a series of short films, profiling Volvo CE customers using Volvo machines in an array of innovative construction projects. “To build the world we want to live in’ is an ambitious statement, but one that brings alignment and purpose to Volvo CE’s sustainability ambitions,” says Martin Weissburg, member of the Volvo Group executive board and president of Volvo CE. 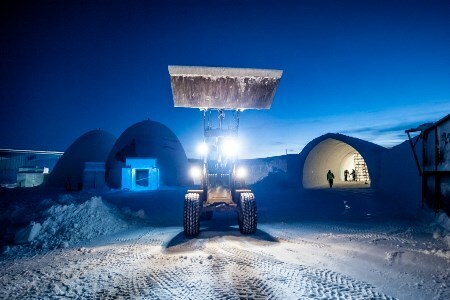 “We chose to feature the ICEHOTEL in the brand campaign because it embodies the Swedish heritage of the Volvo brand. It is an innovative project, representative of its distinctive national culture, and above all, supports the Volvo CE purpose – ‘to build the world we want to live in’, says Bill Law, senior vice president of corporate communications at Volvo CE. The media film series culminates with a final brand film, ‘Good morning tomorrow’, which profiles a range of customer success stories, all endeavoring to build a better future for society. The campaign not only embraces the quest for a better, more sustainable world, it also supports the Volvo brand’s strong heritage and leading position in safety, quality, and environmental care. Furthermore, ‘Building Tomorrow’ reinforces the Volvo Group’s mission of ‘driving prosperity through transport solutions’, as it highlights how Volvo machines are contributing to both customer and company success. “As a result, the campaign promotes Volvo customers’ businesses, and, we hope, motivates others to work towards a sustainable future too,” says Niklas Nillroth, vice president of environment and sustainability at Volvo CE. “The world is transforming, customer requirements are changing, and with this human-centric approach we want to show how Volvo will continue making a beneficial difference for people everywhere, now and in the future,” says Bill Law. “We believe in a sustainable future. And together, with our customers, we are turning this belief into a reality,” he concludes.